Influenza, also known as the flu, is a disease which is caused by a virus that attacks the respiratory system. Influenza viruses were probably responsible for the disease described by Hippocrates in 412 BC. Back in 1918 a world-wide pandemic killed more people than the first World War. Its cause was the Spanish flu. It is the most devastating pandemic that is known. Other major pandemics were the Asian flu pandemic in 1957 and the Hong Kong Influenza pandemic in 1968. In 1989, the United Kingdom suffered the loss of an estimated 26,000 people to influenza . In Canada, every year an estimated 7000 people die from influenza. In the United States, every year 5%-20% of the population becomes infected, around 200,000 people are hospitalized from the flu, and around 36,000 deaths are cause by the flu. 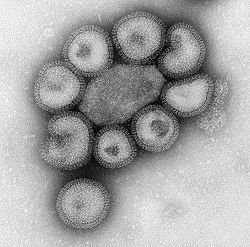 There are many different strains of influenza, but they can be separated into three main viruses; A, B, and C. A person with influenza is at risk of a serious infection of the lungs. The risk of infection or death is higher for the elderly and young children. Influenza symptoms are sometimes thought to be similar to colds but influenza ends much worse if not treated properly. Influenza symptoms include fever, cough, runny nose, and sore throat. It can also include tiredness, muscle pain, and headache. Some other viruses such as colds can cause some of the same symptoms, but influenza symptoms tend to be worse. Symptoms start around one to four days, after a person is first exposed to the virus. The fever along with other symptoms can last seven to ten days. The cough, muscle pain, and weakness can last up to two weeks following the last of the symptoms. There are three main types of Influenza which include A, B, and C. All three influenza viruses are characterized into different strains. New strains of influenza are being found all the time that replace old strains. This is why the influenza vaccine is updated every year. Type A: The Influenza A virus (also known as avian influenza) infect people and animals, but wild birds are the main host for the virus. Their are many subtypes of Influenza A. The subtypes are determined by two proteins that are found at the surface of the virus, the hemagglutinin (HA) and neuraminidase (NA). The subtypes is determined by the types of these proteins. There are at least 17 ​​different HA antigens. These subtypes are named H1 through to H17. There are at least 9 NA ​​different antigens, named N1 through to N9. Influenza A is the only flu virus that will affect birds. Usually, wild birds do not get sick when they are effected with influenza. Virions have separate hemagglutinin and neuraminidase spike proteins. Undergo antigenic shift and drift. Genome comprises eight molecules of RNA ranging from 900 to 2350 nt. Type B: Influenza B viruses are found only in humans. These viruses are not classified by their subtypes like Influenza A. Virions have separate hemagglutinin and neuraminidase spike proteins. Undergo antigenic drift only. Genome comprises eight molecules of RNA ranging from 900 to 2350 nt. Type C: Influenza C only causes a slight illness in humans. These viruses also are not classified into subtypes. Genome comprises seven molecules of RNA ranging from 1000 to 2350 nt. Virions have no neuraminidase. Undergo minor antigenic variation. Because of the influenza virus has eight strands of RNA, if an individual or animal becomes infected by more than one type of virus, it is possible to generate novel combinations of viruses, producing diversity very rapidly. This is called reassortment and it occurs in influenza A viruses in nature. This is important in the appearance of pandemic in human populations. ↑ Palese, Peter; Shaw, Megan L (2006). Knipe, David M.; Howley, Peter M.. ed. Fields Virology (5th ed.). New York: Lippincott Williams & Wilkins. ISBN 0-78176060-7. ↑ Beveridge, W. I. B. (1977). Influenza: The Last Great Plague:An Unfinished Story of Discovery. New York: Prodist. pp. 30-33. ISBN 0-88202-118-4. ↑ Carter, John; Saunders, Venetia (2007). Virology:Principles and Applications. New Jersey: John Wiley & Sons. p. 265. ISBN 978-0-470-02387-7. ↑ Van-Tam, Jonathan (editor); Sellwood, Chloe (editor and chapter author) (2010). "4:Brief History and Epidemiological Features of Pandemic Influenza". Introduction to Pandemic Influenza. Wallingford, Oxfordshire: CABI. pp. 41-56. ISBN 978-1-84593-578-8. ↑ 5.0 5.1 "Facts about Influenza (the Flu)". http://www.bchealthguide.org/healthfiles/hfile12b.stm#E46E1. ↑ "Seasonal Influenza (Flu) - Key Facts about Influenza (Flu) & Flu Vaccine". http://www.cdc.gov/flu/keyfacts.htm. ↑ 7.0 7.1 7.2 Dimmock, N. J.; Easton, A. J.; Leppard, K. N. (2007). "Appendix:Survey of Virus Properties". Introduction to Modern Virology (6 ed.). Malden, MA/Garsington Road, Oxford: Blackwell Publishing. pp. 457. ISBN 1-4051-3645-6. ↑ Flint, S. J.; Enquist, L. W.; Racaniello, V. R.; Skalka, A. M.. Principles of Virology:Molecular Biology, Pathogenesis, and Control of Animal Viruses (2nd ed.). Washington, D.C.: ASM Press. p. 814. ISBN 1-55581-259-7. ↑ Webster, Robert G (1999). Domingo, Esteban; Webster, Robert G.; Holland, John. ed. Origin and Evolution of Viruses. London: Academic Press. p. 377. ISBN 0-12-220360-7. This page was last modified on 13 April 2015, at 18:30.